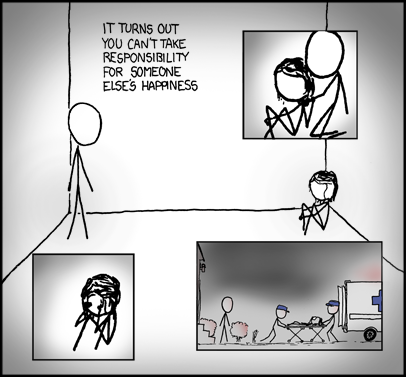 I’ve been following the xkcd webcomic for quite a while now. The comics are usually pretty funny and tech related to boot. It is… well… striking. I really am at a loss for words to describe it. When I first saw it I think I sat there looking at it for 10 minutes or so and then I jumped into the forums on the site to see if anyone had any better explanation than I did. Nobody did. The one question that I did expect to find was there in several places, “I wonder what’s wrong with her” and “I hope she’s okay”. I think that we techie guys have a tendency to try to fix things, whether that be our computer hardware, our home theater system, our OS desktop, or our significant other. My wife has accused me more than once of trying to solve a problem for her when all she really wanted was for me to listen. If the purpose of art is to make you think, reflect, feel; this piece has definitely accomplished it’s mission. Well done, sir. I commend you. I’m slightly sobered by this somber reminder that we can’t always fix everything. Especially on this day before Valentine’s day. Word. This comic hit me like a ton of bricks. I went through something similar nearly 10 years ago and seeing that single comic brought back a wave of emotions. The guy that does it, does more with stick figures and wit than most folks could dream to. Leon, I think one of the reasons it resonated so strongly with me was that it hit close to home as well. I've been in similar situations a couple of times; I think we all have. Agreed on the wave of emotions. Wow. Thanks for sharing this, Dan. It hits extremely close to home and I am just struck silent.